By Edith O’Shaughnessy. Originally written in the form of a series of letters to her mother, this book turned into one of the most insightful accounts of the political upheavals in Mexico prior to the First World War. Stationed along with her husband—America’s chargé d’affaires in Mexico—O’Shaughnessy used her keen eye, racial awareness, and sharp wit to record a dramatic period of the Mexican Revolution, from October 8th, 1913 through to the breaking off of diplomatic relations on April 23rd, 1914. She shows how democracy was totally unsuited to the Second World nature of Mexico, and of how continuous American meddling in the affairs of that nation—and other parts of Latin America—have never served any purpose except to incite hatred against Americans. 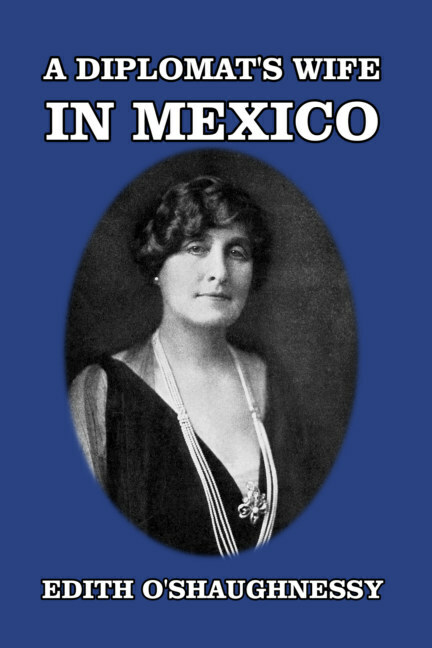 The author’s account of these events earned her fame and praise in diplomatic historical circles, and her all-too-accurate observations on race, civilization, and Mexico have been proven correct countless times over since this book was first published in 1916. Because of their too close personal relationship with Huerta, the O’Shaughnessys were eventually recalled from Mexico. “As Dooley remarks, “There is no such word as ‘ix-Prisidint’ in Mexico. They are known as ‘the late-lamented,’ or ‘the fugitive from justice’; and the only tr’uble the country has with those who remain is to keep the grass cut. “We can put in any sort of government in Mexico—but can we keep one in? We encouraged the powers of dissolution around Diaz, recognizing and aiding Madero. The world knows the result. History always repeats itself here, and the writing on the wall is always in blood. “Today is the Feast of the Virgin of Guadalupe, the patroness of Mexico and of all the Lupes. For the last few days the mysterious Indian world has been hurrying to the shrine from far and near. I went out there this morning with dear Madame Lefaivre and Mr. de Soto. The crowd was immense, the same types, costumes, habits, language, gestures, even, that Cortés found on his arrival, unmodified (and unmodifiable, which Washington cannot understand) by four hundred years of surrounding civilization. “The British vice-consul at Palacio Gomez, Mr. Cunard Cummings, came for lunch. He has had a thorough experience with both rebels and Federals at Torreon, and has terrible stories to tell of both sides. You don’t change Mexican methods by draping them in different banners. In fact, it isn’t the banner, here, but the kind of hand carrying it, that makes the difference. This new edition has been completely reset and contains 175 explanatory footnotes which allow the modern reader to become better acquainted with the background details of the events described. About the author: Edith O’Shaughnessy (1876–1939) was a journalist, biographer, film screenwriter and wife of United States chargé d’affaires in Mexico, Nelson O’Shaughnessy. In that latter capacity, she saw Copenhagen, Berlin, St. Petersburg, Vienna, Bucharest, Mexico, and finally Rio de Janeiro.